So a recently released poll claims that 43% of people believe God helps Tim Tebow win football games. 43%!! 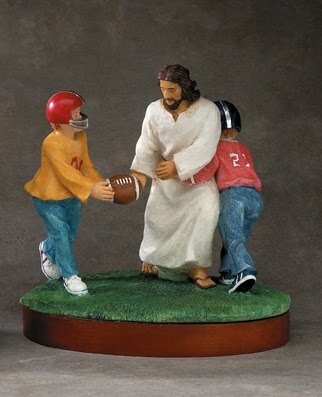 If I knew how to use Photoshop I'd totally create a picture of Jesus wearing a Broncos helmet. Here's a link to the article from Fox Sports. One of the best-known religious athletes was Sandy Koufax who famously refused to pitch Game One of the 1965 World series because it fell on Yom Kippur. Well, he went on to pitch in three more games that series and was named MVP as the Dodgers defeated the Twins in seven games. A lot has been said about Koufax's faith and courage but it has never been suggested that the Dodgers won the World Series that year because God especially smiled upon Sandy Koufax. I have very little patience with a theology that insists God cares who wins football games or somehow intervenes. There are equally faithful players, albeit less demonstrative perhaps, on every team in the National Football League. Is their faith somehow less important or does God just really dig "Tebowing?" It's a very slippery slope. And anyway, if you want further proof that God could not care less about the outcome of sporting events, I have my own Exhibit A. Last spring and summer another Episcopal priest, Tom Mulvey, and I coached our 10-year-old sons' baseball team. With this rationale you'd think our team would have been a shoo in to take the little league World Series in Hingham. I think we won three games all season. No, we didn't do any Tebowing before games and I guess we could have created a pre-game ritual involving two bats in the form of a cross at home plate. And, believe me, with the players we had it would have taken a miracle to win more games. But if two clergy coaches couldn't get a break why would anyone think someone else should? Don't get me wrong. As a huge Baltimore Ravens fan, I was delighted to see the Broncos bounce the Steelers out of the playoffs last weekend. I just can't imagine God sitting in a La-Z-Boy chair watching the game on a big screen TV and deciding who should win. This website will not be to some people's taste. Outsports stays away from speculation like that. It is for gay men who like to look at jocks and talk sports. So, when Outsports starts in on Tebow, you know people are paying attention. What a humorous piece. I liked it. Oh, and may God bless your little team. Great peice of writing ! See James Martin SJ , WSJ , January 9, 2012 "Does God Hear Tim Tebow's Prayers ?" Excellent piece of theology. He got millions to read his brief and laser-like article cause they thought they were going to be reading about football ! I'm an Episcopal priest and my son played four years college football (starter, too!) two of which were with Joe Flacco, QB Baltimore Ravens. We are all huge Ravens fans !!! By the way, could I ask for prayers for their game against "the darkness"---I mean NE Patriots. Thanks. Hope the good Lord is watching that one ! Stuart, it warms my heart to know that there's another rabid Ravens clergy family out there! Being in the heart of Patriots country (South Shore of Boston) I'm tempted to wear a purple chasuble on Sunday. Well, if it weren't for the liturgical police. How great that your son played with Joe Cool and the Blue Hens!